Born and raised in Alberta, Jill Ejdrygiewicz had never heard truer words. Ejdrygiewicz had returned west after already living in Nova Scotia during her Marine Biology studies at Dalhousie University. The thought of moving back to NS felt like home, and so Ejdrygiewicz did her own research on programs within the province and found her passion at NSCC, the Nova Scotia Community College. The Marine Geomatics program sparked her interested the most, as it tied into her previous education and research experience. She quickly realized her strengths and passion for map-making, so she made the decision to transfer to the Geographic Sciences program, concentrating in cartography. "Looking back, it was the best decision I could have made. I love mapping; it's definitely my niche," she says. Geographic Sciences is a two-year program offered at NSCC's Centre of Geographic Sciences in Lawrencetown. It allows students to build a solid starting foundation for a career in geographic sciences and geomatics. The first year introduces students to using geomatics tools and technology like GPS and GIS. Students then branch out into one of four concentrations and become specialized during their second year. The cartography program came with an extremely heavy workload and long work days, but Ejdrygiewicz says it was worth every second. "A challenge I had was my natural attention to details and perfectionism. That being said, cartography is just that: a detail-oriented discipline gifting beautiful, artistic renditions of geographic data and maps. As the world continues to change, maps will likewise be changing. In a way, it's like I get to travel vicariously through the maps I design and produce," she says. Not only did Ejdrygiewicz feel the weight of the workload, but along with her diagnosis of Relapse Remitting Multiple Sclerosis, the days took a toll on her health. "But I continuously pushed through them and worked harder than ever because I knew school was only temporary. Walking across the stage at graduation and starting a career that I was passionate about was my light at the end of the tunnel," she says. Ejdrygiewicz's hard work led her to begin an internship as a Research Assistant with NSCC's Applied Oceans Research Group (AORG). 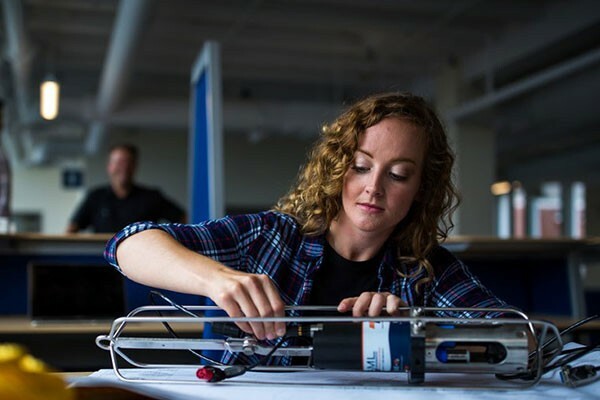 She applied her skills in cartography to design and produce a detailed and descriptive map poster visualizing a proposed Marine Protected Area (MPA) in the Gulf of Saint Lawrence's Laurentian Channel, and assists industry and government partners with her research and mapping skills. Ejdrygiewicz graduated as a cartographer, and her greatest reward from her hard work was being presented with the Rising Star Award—meant for a student who embodies the NSCC alumni tradition of excellence and ambassadorship. Ejdrygiewicz wholeheartedly thanks two of her instructors, Monica Lloyd and Martha Bostwick, who were patient, supportive and overall inspirational mentors. "I can only hope to be half as talented at cartography as they are," she says. Moving forward, Ejdrygiewicz will be showcasing her applied research involvement in Ottawa early November, and will be presenting about the Canadian Healthy Oceans Network and MPA mapping during the 2018 Geomatics Atlantic conference later that month.